CHICAGO - Feb. 21, 2018 - PRLog -- Cures Within Reach, a leading global nonprofit focused on repurposing research as a fast track to improving patients' lives, today announced that The Leukemia & Lymphoma Society (LLS) is the recipient of the 2018 Golan Christie Taglia Patient Impact Philanthropy Award. Cures Within Reach selected LLS for being one of the earliest and leading major disease-specific nonprofits to fund repurposing research to complement its de novo research portfolio, and for partnering with academia, government and other philanthropic organizations to advance repurposing research as a way to drive treatments to patients with various blood cancers. Repurposing research clinically tests approved drugs, devices and nutraceuticals to find new treatments for unsolved diseases. 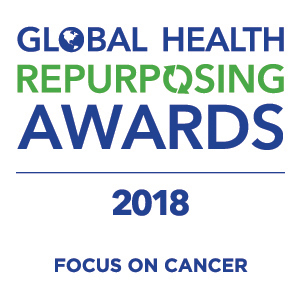 Cures Within Reach will honor LLS, and two other honorees, for their outstanding achievements in creating impact for cancer patients by repurposing existing science and medicine at its 6th Annual Global Health Repurposing Awards (GHRA) on June 26, 2018, at City Winery in Chicago. Cures Within Reach will announce the other honorees in the coming weeks. "In addition to its foundational research and partnering initiatives, our selection committee wanted to acknowledge LLS for its funding of repurposing research in chronic lymphocytic leukemia and multiple myeloma, and its support for repurposed drugs to stimulate the immune system to attack a wide variety of blood cancers," said Dr. Bruce Bloom, CEO of Cures Within Reach (http://www.cureswithinreach.org). "Leukemia & Lymphoma Society (http://www.lls.org) is greatly honored to receive the Golan Christie Taglia Patient Impact Philanthropy Award," said The Leukemia & Lymphoma Society President and CEO Louis J. DeGennaro, PhD. "Drug repurposing as a strategy to rapidly advance new therapeutic options has been a hallmark approach in blood cancer drug development since the repositioning of thalidomide as a therapeutic agent for the treatment of multiple myeloma and myelodysplasia in 2006." Speaking to the strategic significance of repurposing, Dr. Gennaro added, "Many blood cancer patients have benefited from drugs developed in this way and The Leukemia & Lymphoma Society has seen great value in supporting repurposing research in our pursuit of new treatments for the patients we serve." The 2018 GHRA event will honor leaders in industry, science and philanthropy who have made a patient impact through cancer-related repurposing. Cures Within Reach pointed to the ongoing demand worldwide for additional therapies to combat cancer for its decision to highlight the work of this year's honorees. The Golan Christie Taglia Patient Impact Philanthropy Award recognizes an individual, group or organization that has created positive patient impact by advocating for patients or contributing to the growth of repurposing research through financial, operational or professional philanthropic support. The award was named in honor of its first awardee, Golan Christie Taglia LLP, in gratitude for its many years of financial and in kind support for Cures Within Reach. For more information about attending the 2018 GHRA to hear inspiring stories, honor all awardees and support the Cures Within Reach mission, visit cureswithinreach.org/ghra-2018. Cures Within Reach (CWR) is a US-based global philanthropic leader that improves patient quality and length of life by leveraging the speed, safety and cost-effectiveness of medical repurposing research, driving more treatments to more patients more quickly. CWR catalyzes research to facilitate and validate repurposing opportunities that create clinical impact, and enables and facilitates conversation and action among stakeholders that help transform healthcare through repurposing opportunities. Through repurposing, CWR drives both market impact and health savings to patients and patient groups, from academia / researchers, with payers and the healthcare industry and with support from the government, philanthropy and others. CWR's repurposing research projects have generated over a dozen "new" treatments making patient impact through off-label use in clinical practice or through a commercialization track. CWR currently has a global portfolio of 20 repurposing research projects, either funded or approved for funding., as well as over 180 repurposing research projects available for funding in a wide range of diseases on its CureAccelerator® site. Visit us at cureswithinreach.org (http://www.cureswithinreach.org) or follow us via Twitter @CuresWReach, LinkedIn (LinkedIn.com/company/cures-within-reach), YouTube (YouTube.com/cureswithinreach) or Facebook (Facebook.com/CuresWithinReach). Cures Within Reach built CureAccelerator (app.cureaccelerator.org/home) to provide a global collaboration space and marketplace for repurposing research that can deliver effective solutions to unsolved diseases. CureAccelerator was built with a grant from the Robert Wood Johnson Foundation to provide a platform in which drugs, devices and nutraceuticals approved for one or more human diseases can be repurposed to create "new" treatments in other diseases. CureAccelerator has over 1,600 users who have proposed more than 180 projects, of which more than 20 have received funding and are moving towards patient impact. The Leukemia & Lymphoma Society® (LLS) is the world's largest voluntary health agency dedicated to blood cancer. The LLS mission: Cure leukemia, lymphoma, Hodgkin's disease and myeloma, and improve the quality of life of patients and their families. LLS funds lifesaving blood cancer research around the world, provides free information and support services and is the voice for all blood cancer patients seeking access to quality, affordable, coordinated care.